Do You Know How to Handle Bees & Ensure Safe Bee Removal? Living in Mesa and the beautiful state of Arizona it is common to see bees almost year round! Buzzing busily from flower to flower, bees help to pollinate a variety of foods grown in Mesa plus they make honey and beeswax which are used in many products. However, when bees decide to make their hive in or around your home then problems can arise with bees swarming to protect the hive and their queen. Learn safe steps you can take if you encounter a bee swarm and where and when to call for immediate bee removal. Anytime you come across a swarm of bees it is important not to go near it! Leave the area as quickly as possible and even though it’s human nature, try to avoid swatting at any of the bees as that will only make them more agitated. Because it is hard to tell if you are dealing with Honey bees or Africanized ‘Killer’ bees, always assume they are the more aggressive Africanized bees. Usually if you can quickly get in your car and make sure all the windows are rolled up you will be safe from bee stings. It is best not to spray water near them or make very loud noises as those have been known as triggers for bee swarms to attack. If the bee swarm is in a high traffic area, like the entrance or exit of a public building or near children, like a school or a park, it may be good to warn others in the area or call the city of Mesa so they can determine if bee removal is appropriate or at least post warning signs to avoid the area. Is Bee Removal Needed for Every Bee Swarm? Not every bee swarm requires bee removal. Some swarms are just bees migrating to find a new place for their hive. You can determine if it’s a moving bee colony by monitoring their activity and if the bees are only there a day or two then move on, it’s safe to bet they have decided not to make your home or yard their permanent residence! However, if you notice the swarm is gone but there are still a lot of bees flying in and out of a particular place that is a possible sign of bee infestation. You’ll have to decide if that area will be okay for them to stay, for example, if it’s on the outskirts of your property and not bothering anything. On the other hand, if it’s on your home then you will want to call a professional bee removal expert right away before the bees start making honeycomb that can cause expensive damage to the walls of your house. Are There DIY Bee Removal Tips? There are some preventative tips to keep bees from building a hive in your home. One suggestion is planting peppermint around your home because bees are naturally repelled by its scent. Another idea is using moth balls and setting them in bowls or hanging them in cheesecloth around the outside of your home or patio as this has proven a good repellent as well. There are also a variety of products at the local hardware store to repel bees and other insects. However, when it comes to bee removal we suggest letting the experts handle that. They will have the proper protective clothing and tools to safely remove the bees, the hive and comb if it is a more serious case. 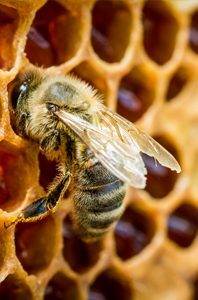 The choice to call for bee removal is up to you but if there is a threat of bees swarming and stinging animals or children, we always suggest at least having a bee removal expert take a look at the situation so they can explain your options. Hopefully this information has helped you learned at least one thing you didn’t know before about bee removal and reacting to swarms! If you have any questions or want to know more about bee control tips, give us a call anytime!